HHS is boosting the $1.3 billion originally earmarked this year for care of migrant unaccompanied minors by more than $100 million, a sign that the system's expenses are increasing under enhanced scrutiny following the Trump administration's halted family separation policy. "HHS is utilizing the secretary's transfer and reprogramming authorities to provide additional funds for the care of unaccompanied alien children," HHS Deputy Secretary Eric Hargan said in a statement, noting that the department used its transfer authorities to supplement program funding in 2012, 2013, 2014 and 2017. HHS did not confirm the amount, but a congressional aide close to the issue said the department is maxing out the 10% boost allowed to the original appropriation amount. The new allotment will come from the department's discretionary funds. On Thursday, HHS also made news with its proposal to withdraw from the 1997 Flores Agreement that set standards of care for unaccompanied minors. The Trump administration used the Flores Agreement's ban on indefinite detention of minors as the basis for its former "zero tolerance" family separation policy. The rule would allow Immigration and Customs Enforcement (ICE) to detain children with their parents. HHS did not specify which programs the reallocated money will come from. This is the second time the department has supplemented the fiscal 2018 appropriation for the HHS Office of Refugee Resettlement (ORR) with other money. Earlier this summer, the department transfered $17 million in unspent fiscal 2017 funds from the Ryan White AIDS program to its unaccompanied minor program, an HHS spokesperson said. The fiscal 2018 funding for unaccompanied minor care was the largest amount to date. The congressional appropriation limits transfers among HHS accounts to not more than 3%, but the refugee and entrant assistant account lifts this cap to 10%. The ORR in fiscal 2018 received $1.86 billion for refugee and entrant assistance. Of this, $1.3 billion was designated for unaccompanied minors. And of that funding, $320 million was earmarked for medical and transitional services, and $155 million for social services. The ORR manages the contracts for housing, medical care and social services for all immigrant kids under 18, most of whom cross the border alone. The ORR oversees more than 100 facilities in 17 states. A budget justification for fiscal 2019 from the HHS Administration of Children and Families showed that the agency allocates about 15% of its funding for medical care, background checks and family reunifications. About 80% of the funding goes to "bed capacity care," and 5% goes to administrative costs. As the program and its funding have grown, so have contractors' profits from overseeing the minors' care. Southwest Key, a not-for-profit and the agency's largest contractor, saw revenue jump from $95 million in fiscal 2013 to nearly $243 million in fiscal 2016. The government contract was valued at nearly $460 million for fiscal 2018, and CEO Juan Sanchez saw a salary bump of more than $1 million since 2010, according to tax filings. On top of increased vetting of migrant crossing the border, the Trump administration has yet to reunite more than 500 kids separated from their parents under Attorney General Jeff Sessions' former "zero tolerance" policy that ended earlier this summer — despite the court order that HHS needed to unite families by July 26. An HHS report from earlier this month that pushed back against news of abuse of minors inside contracted facilities noted the fluctuating numbers of kids in the agency's custody over the past several years. These numbers jumped from fewer than 8,000 children before 2011 to 13,625 children by the end of fiscal 2012 to nearly 60,000 in fiscal 2016. Hargan in his statement called the transfers "only a temporary solution to the sad consequence of a broken immigration system." "Based on the current growth pattern, and increased length of time needed to thoroughly vet appropriate sponsors for the ensured safety of unaccompanied alien children, HHS is preparing for the possibility of heightened capacity to continue so it can meet its responsibility, by law, to provide shelter for those referred to our care by the US Department of Homeland Security (DHS)," Hargan added. 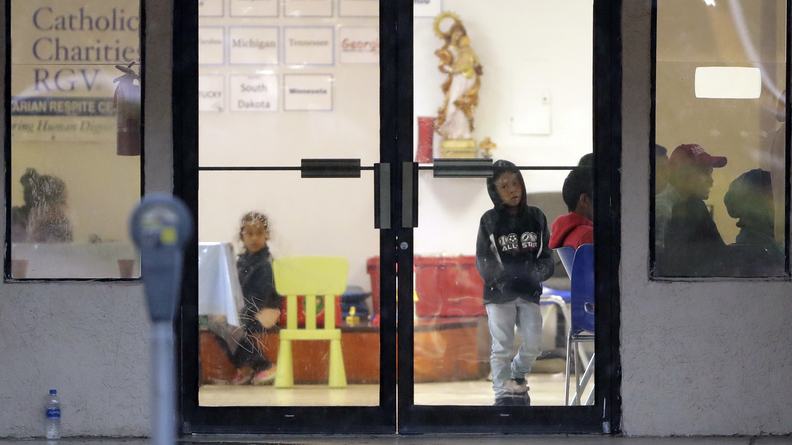 Meanwhile the proposed rule, which has tried to sidestep the 20-day limit for detention of migrant children upheld by U.S. District Court Judge Dolly M. Gee, has provoked outcry and will likely spur more litigation. The proposed rule states that it would ensure that "all juveniles in the government's custody are treated with dignity, respect and special concern for their particular vulnerability as minors, while doing so in a manner that is workable in light of subsequent changes." But it would also extend detention authority over minors to ICE. "Most prominently, the rule would create an alternative to the existing licensed program requirement for family residential centers, so that ICE may use appropriate facilities to detain family units together during their immigration proceedings, consistent with applicable law."